Home » Forums » Public Access » Chit Chat » Riots in Vancouver!! So Canadians are sore losers, we already knew that. There were some very distasteful scenes in Vancouver last night. Clearly upset at having lost the Stanely Cup Final series to the Boston Bruines, angy supporters could not quell the rage from losing a series that they felt their team should have won. But amid all the fracas, terror and violence two people could just could be not restrained. Malty, did you have to pronounce the name of the cup in a cockney accent? Just read up on the situation a bit...hadn't before. [Police Chief Jim Chu] called those who incited the riot "criminals and anarchists" and said officers identified some in the crowd as the same people who smashed windows and caused trouble through the same streets the day after the 2010 Winter Olympics opened in 2010. "These were people who came equipped with masks, goggles and gasoline," he said. "They had a plan." So judging from what it says here...obviously there is a difference between useless anarchists/criminals who are rioting just because they're dumb versus disappointed hockey fans who are actually Canucks followers. If most of them really are simply anarchists or criminals who are far from hockey fans, they need to get a life. 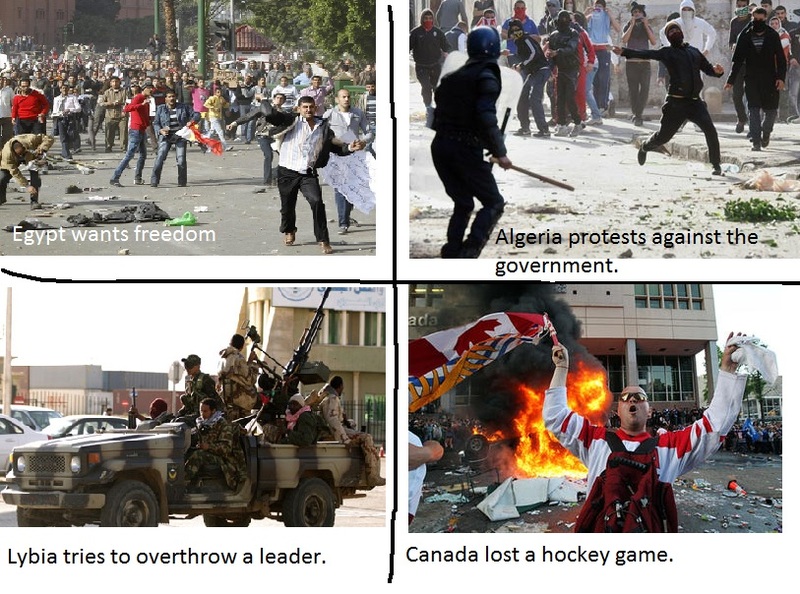 ROTFL that Egypt, Algeria, Lybia & Canada Image is far to hilarious. I think they just like to get it on even if they win or lose, But wreckin their own city, welp they have had to much fun already for sure. Show a riot,ppl will riot.TV is a mind tool 4 the masses,or the weak(Not sure yet). DONT LOOK. The rate of a human in hrtz is 82. BE ->Careful they can tune u in. Be sure to wear your tin hat you got from the movie Signs.